In March, to celebrate Women’s History month, I’ve taken some time to focus on children’s books written about creative women who followed their passions. These women’s combinations of skill, artistry, and drive led them all to achieve personal goals as well as to make significant contributions to their creative fields. As a little girl, Ann Cole learned about sewing from her mother and grandmother in the family shop. 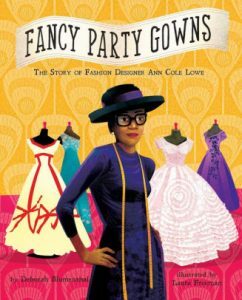 When she was 16 and her mother died, Ann finished the dress her mother was sewing for the wife of Alabama’s governor, then took over running the business. In design school a few years later in 1917, Ann was separated from the other students because of segregation, but that did not stop her. She went on to open her own design studio in Manhattan and to design gowns worn by famous women, including Jacqueline Bouvier Kennedy’s wedding dress and the dress worn by Olivia de Havilland when she won the Best Actress award at the 1947 Academy Awards. As a young girl in 17th-century Europe, Maria Merian was interested in bugs and moths and butterflies at a time when people didn’t really understand the ways of nature - and at a time when interest in creepy, crawly insects could get a woman accused of witchcraft. But Maria didn’t let that stop her from indulging her curiosity. She took risks and followed her passion to study insects and publish books with beautiful illustrations that she did herself (her step-father was an artist and taught her how to draw and paint - important skills for a naturalist before the invention of photography). Naturalists at the time and for years to come admired and referenced her work, though some criticized her because she had no formal scientific training. The Girl Who Drew Butterflies has been on my TBR (to be read) list for a year. It’s been recommended by colleagues, was on many of the Best of 2018 lists, and recently won the Sibert Award for the most distinguished informational book for children. I am so glad I finally read it; this book deserves all the praise it’s gotten. Merian’s life story is fascinating, in large part because of the challenges she faced living in 17th-century Europe. Sidman vividly brings the time and place to life for the reader by including period artwork that shows what the author is describing, as well as compelling details of Merian’s life that the reader can relate to, even more than 300 years later. Maya Lin: Artist-architect of Light and Lines by Jeanne Walker Harvey: Maya Lin was the daughter of artists and also grew up appreciating nature. When she decided to become an architect, it allowed her to combine her appreciation of art and nature into one career. While studying to be an architect, Maya submitted an entry in the contest to design a Vietnam War memorial in Washington, D.C. The contest had anonymous entries, so the judges didn’t know she was still a student. When Maya’s design won, people were shocked to learn she was so young, and some also criticized her design. Critics felt the long, black walls that seem to cut into and then merge with the landscape were too bleak. Maya defended her design, explaining that her design was meant to be a quiet place where people could truly experience the memorial as they walked past the “names that seemed to go on forever.” Maya stuck by her design, and, eventually, the building of the monument proceeded to create the Vietnam Veterans Memorial that we know today. Darcie Caswell is the Youth Services Coordinator at CRRL. This column originally appeared in The Free Lance-Star newspaper.